Ireland’s Ellen Keane and Nicole Turner both swam lifetime best times in their respective finals of the Women’s 100m Breaststroke at the Paralympic Swimming World Championships in Glasgow tonight to each finish fifth. Thirteen year old Turner was first up in the final of the Women’s 100m Breaststroke (SB6 class*) and shaved yet more time off the huge personal best she set this morning in the heats. 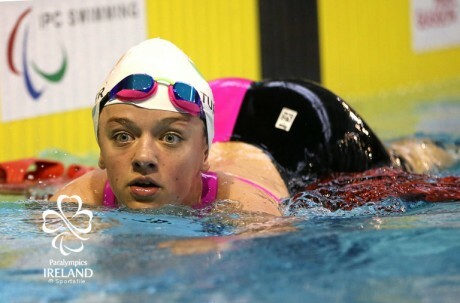 The teenager clocked a time of 1:48.07 to finish fifth in a final that was won in world record time by fellow thirteen year old Tiffany Thomas Kane of Australia in 1:34.95. Beijing and London Paralympian Keane then took to the blocks in the final of the 100m Breaststroke (SB8 class*) and similarly swam faster than ever before setting another personal best of 1:22.50 in finishing fifth. Having won her heat this morning Keane was hopeful of contesting a place on the podium but in an incredibly tightly fought race barely a second and a half separated silver from fifth as double Paralympic champion and world record holder Olesia Vladykina took gold in a new Championship record of 1:17.47. In a packed schedule for her this week Nicole Turner is back in the pool again tomorrow in the heats of the 50m Butterfly. The Laois teenager would regard this as her second best event, and is ranked tenth on times going into it so will have it all to do if she is to progress to the final. London 2012 Paralympian James Scully will be back out before team mate Turner in the heats of the Men’s 200m Freestyle (S5 class) just after 11am. This is the Meath athlete’s leading event and he is ranked seventh going into it so will be hopeful of claiming a place in the final.